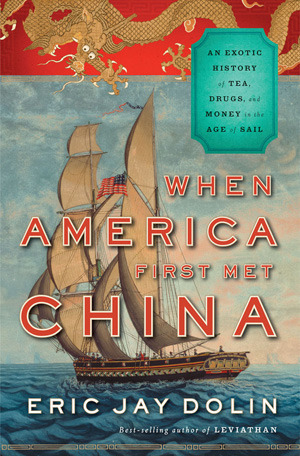 When America First Met China provides readers with a fast paced and highly readable account of America’s first commercial encounters with China. Author Eric Jay Dolin traces the origins of America’s trade with China in the years following the end of the American Revolution through the tumultuous period of the Opium Wars and concludes with the role of Chinese laborers in tying the nation together with the Transcontinental Railroad. Throughout the book, Dolin introduces the various American, British and Chinese personalities who made the early China trade one of the most colorful periods in maritime history. Men such as Robert Morris, Samuel Shaw, Dr. Peter Parker (no relation to Spiderman), Amasa Delano (a distant relative of President Franklin Delano Roosevelt), Charles Elliot, Lin Zexu, and Howqua all come to life through Dolin’s writing. Many of the men, while not household names today, made lasting contributions to American trade, prestige and foreign relations. For instance, a gift from one of the personalities involved in the early China trade, Stephen Girard, helped establish Girard College in Philadelphia – a school for white male orphans which has since become a full scholarship grade 1 – 12 school for children of low-income single parent families. Additionally, the products involved in the China trade – tea, fur, silk, opium, sandalwood and beche-de-mer are all described in detail. The reader is given a thorough understanding of the economics and production techniques of each commodity without being driven to boredom. Having previously written about both whaling and the fur trade , Dolin is experienced in describing the details of 19th century industries. Overall, Dolin does an excellent job of detailing the origins of America’s commercial trade with China and its ebb and flow through the post-Civil War Reconstruction years. The numerous illustrations of period engravings, sketches and paintings help the reader better grasp the locations, ships and products involved in the China trade. When America First Met China is accessible to readers with any level of knowledge about maritime or Chinese history and is worth the read.